Canada’s Foreign Minister says "expansion of settlements is illegal under international law". 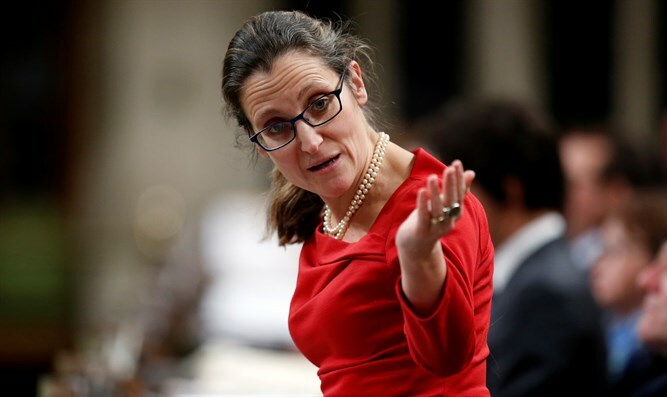 Canada’s Foreign Minister Chrystia Freeland said on Wednesday her country is “very concerned” by the approval in the Knesset of the Regulation Law. "Canada is very concerned ... and we want to underline that this expansion of settlements is illegal under international law," Freeland told reporters on a conference call, according to Reuters. The Regulation Law legalizes and protects thousands of Jewish homes in Judea and Samaria which were built with government backing and lacked absentee land claims, but against which there are now property claims. Under the Regulation Law, homes built on such properties will be allowed to remain, and owners with proven claims to the land will be given a choice of receiving an alternate plot of land or monetary compensation for 125% of their land's value. Canada’s Conservative former Prime Minister Harper was a staunch supporter and ally of Israel. Current Prime Minister Justin Trudeau, a Liberal, has continued the policy started by Harper in which Canada votes against anti-Israel resolutions at the UN, but has also tried to get closer to Muslims. In November, Trudeau’s government announced it will renew funding for the United Nations Relief and Works (UNRWA), despite its well-documented ties to the Hamas terrorist organization. Since winning the election in late 2015, Trudeau has taken the view that Islam is "not incompatible with the Western secular democracy."